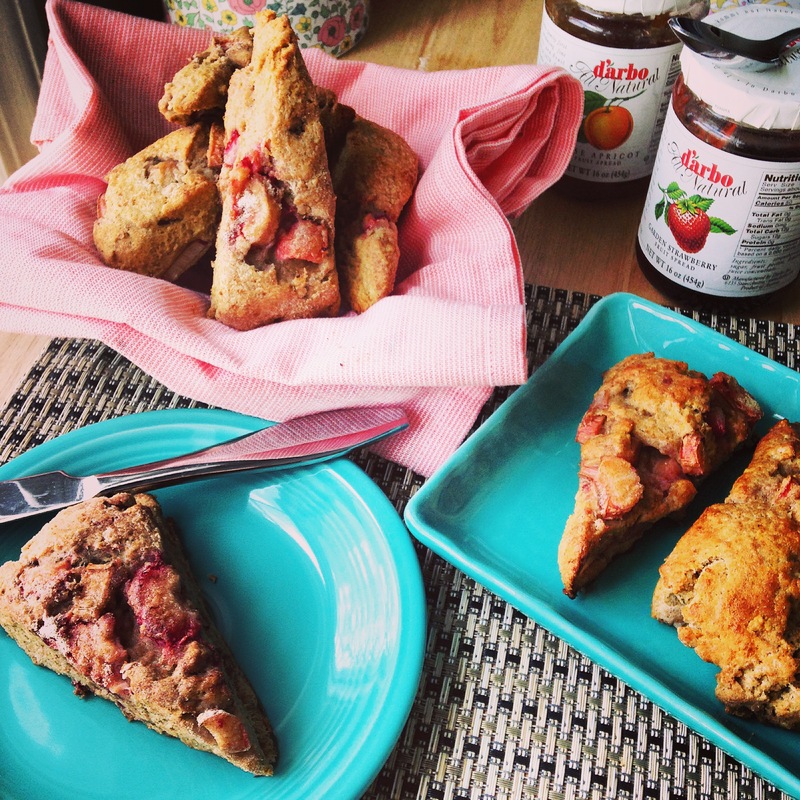 These scones along with some jam would make the perfect homemade gift for mom this Mother’s Day! Keep the butter cold. Much like biscuits or pie crust, scones should be made with extremely cold butter. The chunks of cold butter create steam pockets within the scones as they bake, leaving you with a perfectly flaky texture. Before you start baking, use a sharp knife to slice the cold butter into chunks, then return it to the fridge while you prepare the rest of the ingredients. This will ensure your butter is very, VERY cold. Use a food processor. To keep the butter cold, it’s best to touch the dough with warm hands as little as possible. That’s why people use pastry cutters to work the butter into the dry ingredients while making dough for scones, biscuits, or pie crusts. Using a food processor will give you the same effect as a pastry cutter, except faster without any extra work. Of course, if you don’t have one feel free to use a pastry cutter. 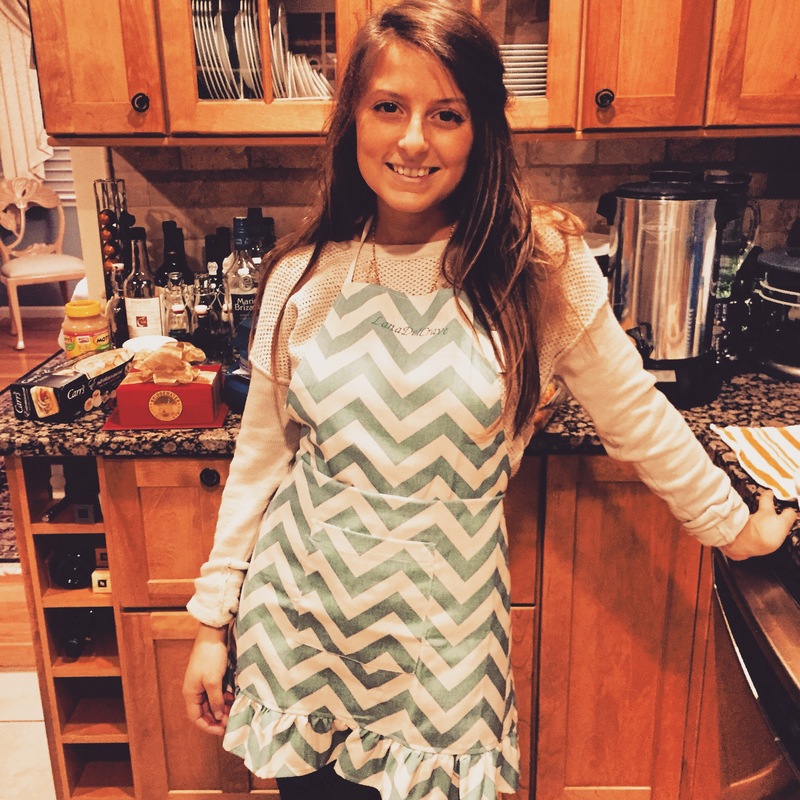 Preheat the oven to 425 degrees. Line a baking sheet with parchment paper or greased tin foil then set aside. Prepare the Fruit: Slice the strawberries & set aside. Slice the rhubarb into 1/2-inch slices then place it into a medium bowl. 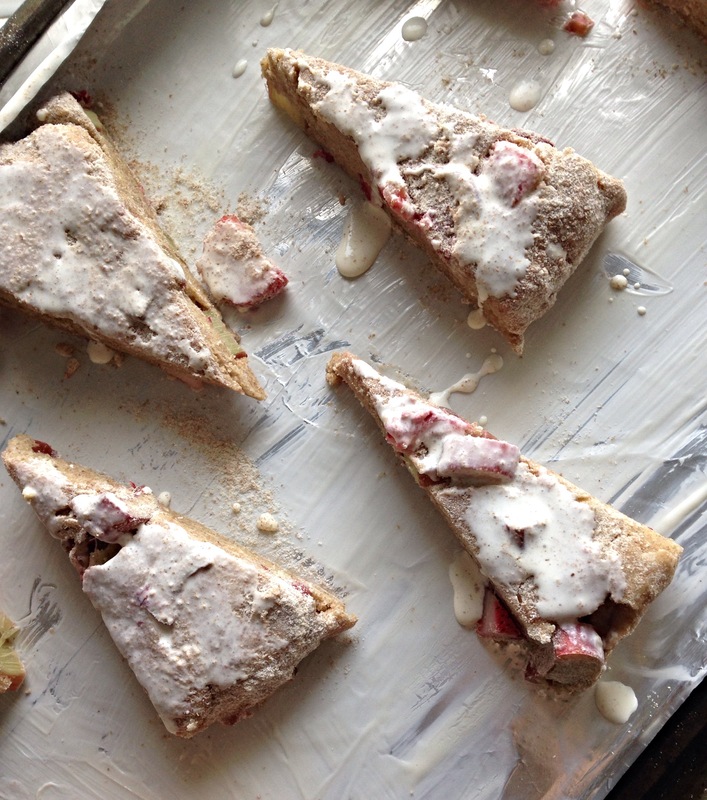 Sprinkle 1 tablespoon of sugar atop the sliced rhubarb, then toss to coat. Set aside. 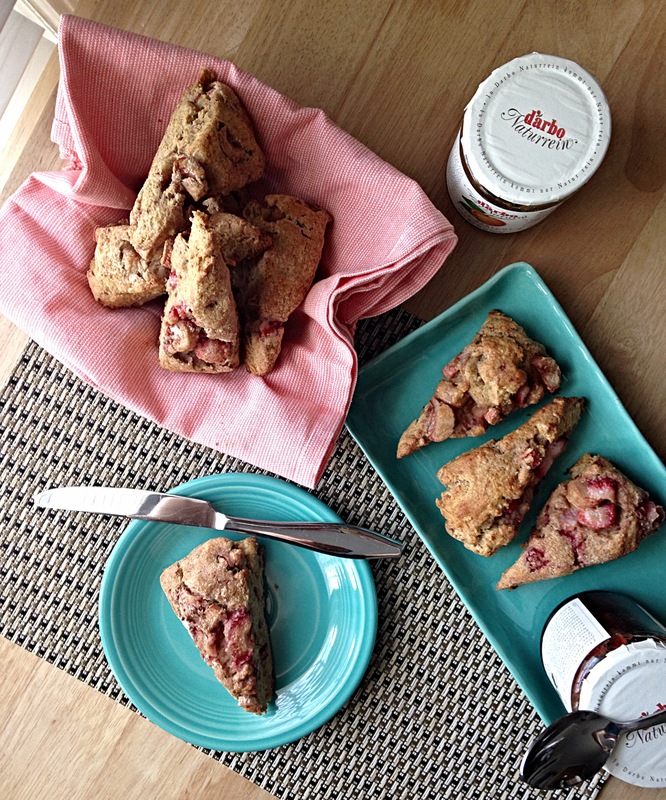 Prepare the Scones: In a small bowl, lightly beat together the egg and 2/3 cup of heavy whipping cream. Set aside. 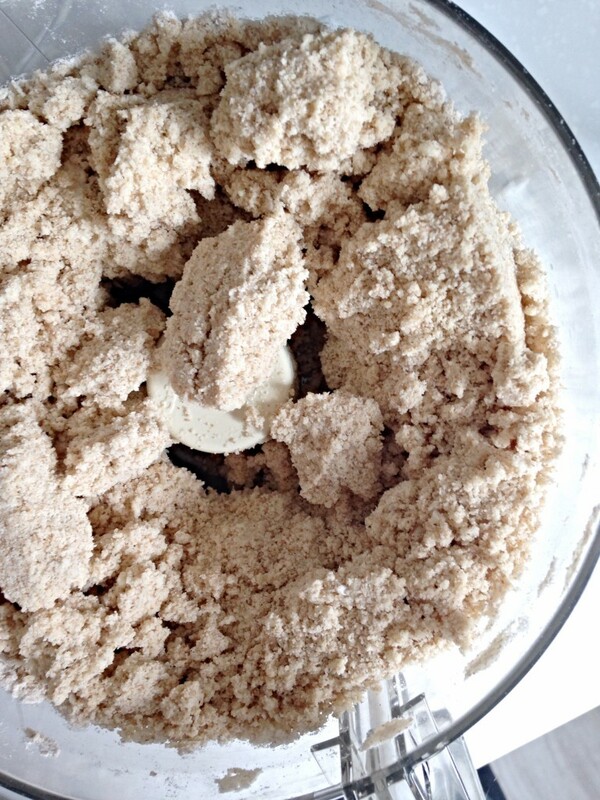 To your food processor, add both flours, 1/2 cup sugar, baking powder, baking soda and salt. Pulse until combined. Add the cold butter & pulse into the dry ingredients 5-10 times, until the batter resembles moist sand. 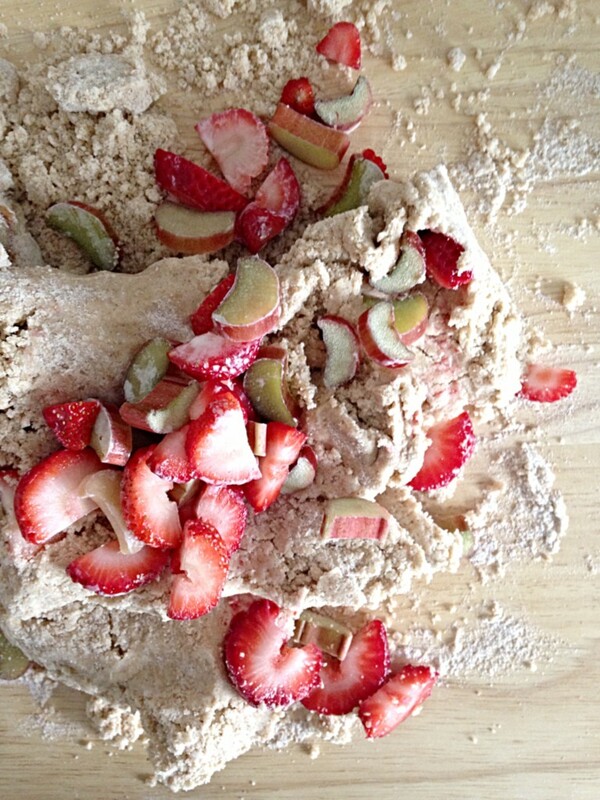 Turn the dough out onto a well-floured cutting board, then gently fold both the strawberries and sweetened rhubarb into the dough with your hands. Using as much extra flour as necessary, shape the dough into a disc. 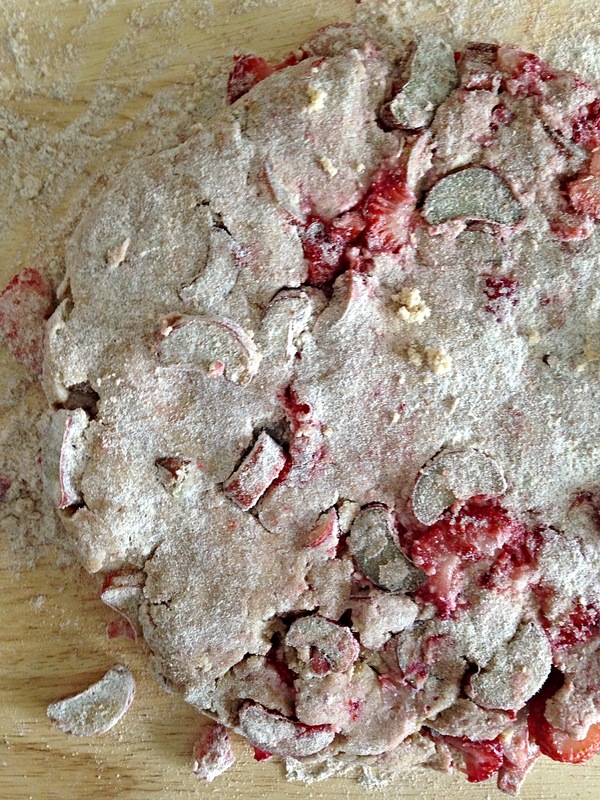 Using a floured knife, cut the disc into 6 scones. 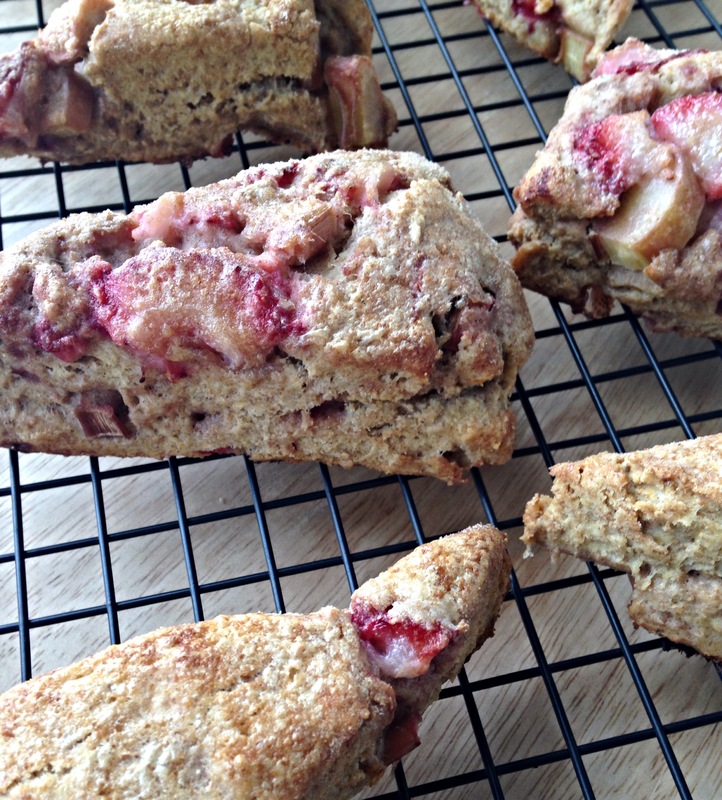 Place the scones onto the prepared baking sheet & put into the refrigerator for 10-15 minutes. After the scones have chilled, remove from the fridge and brush the tops of each with a bit of heavy whipping cream. Lightly sprinkle sugar atop each scone. Bake the scones for 10-12 minutes, until slightly golden around the edges. Serve warm or at room temperature with jam or softened butter.